If you want the sweetest distortion that won't break the bank, check out our newest pedal. Available in a brushed aluminum casing or a slime green casing, Brigitte is a pedal both the gigging and studio musician can't live without. Kuciel Electronics is proud to present our sweetest distortion pedal yet. 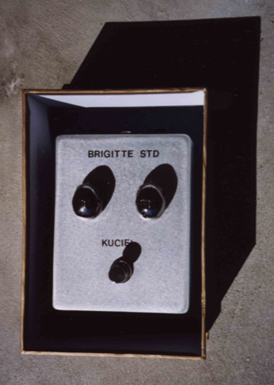 We bring you the Brigitte STD: Super Transmodulated Distortion. The Brigitte STD is one very easy pedal. She'll give you a ride from the driven Tweed sound of the 1950's to the British Invasion "dial on 10" of the 1960's all the way to the very modern American Distortion of the 1990's & 2000's. Brigitte is easy. All she needs is a turn of the dial. The Brigitte STD comes with your choice of the classic brushed aluminum exterior or the very vivid and durable lime-green covering. The choice is yours. The Brigitte STD features discrete components and top notch switches and pots, encased in a hefty aluminum housing. The Brigitte STD can be powered by either a 9-volt battery or a common 9 volt adaptor(Boss PSA or equivelant). Brigitte also has a true hard-bypass switch needed by many modern gigging and studio musicians. Jeff Ziebart individualy tests and tunes each pedal before it is shipped. Jeff signs the inside of each and every Brigitte STD once he approves of her tone and gig reliability. Note: There is a Deluxe Version of the Brigitte STD which features your choice of gorgeous gold or chrome knurled knobs with purple pearl inlays or your choice of gold or chrome skull knobs. This upgrade is at our cost of an extra $30 U.S..
To order, click "how to order" on the top of this page. 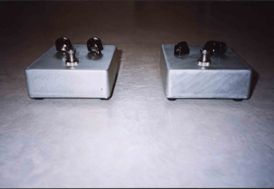 Each Kuciel Electronics pedal comes with a full one year warrantee.